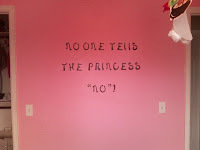 So I FINALLY finished Kadrie's room. 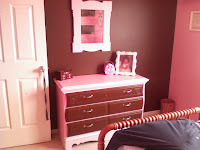 It had been painted but her dresser and mirror had been in the garage waiting for me to come and paint it. Finally, a rainy day pushed me into doing it. I think it turned out soooo cute. She loves pink and brown, possibly due to some brainwashing:). I had to finish it off with a saying that my mom and I came up with about our sweet dear Kadrie. I love that girl, but "strong" doesn't even begin to describe her personality. She loves her room and I am very proud of my work. CUTE!! I love it!! You do good work! !